Many times, you may feel the need to assess yourself. This is known as self-appraisal. Based on what part of your personality or skills you want to assess, there might be a number of parameters to be taken into account. Self-appraisal forms can help you to simplify this process by giving you an idea of the parameters to consider. Don’t know how to design a self-appraisal form. 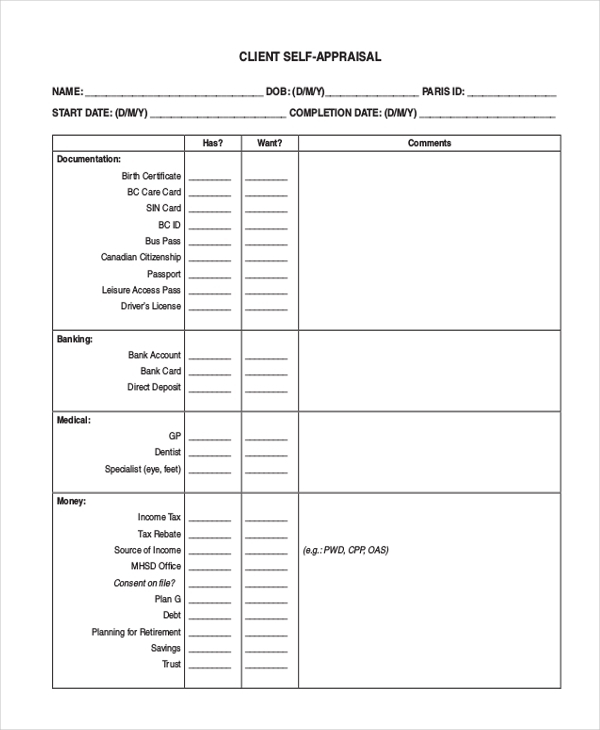 Using Appraisal Forms example is a great idea. 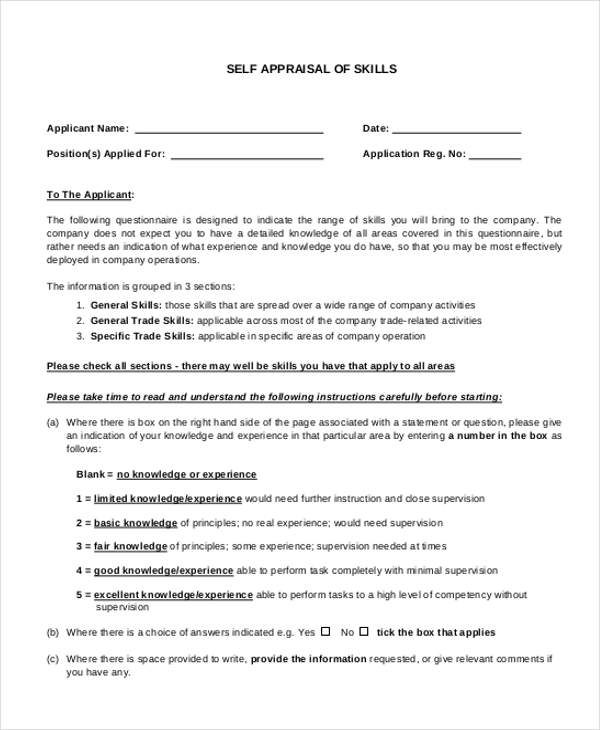 If you have the habit of assessing your skills and traits on an annual basis, using this example form can give you an idea of the right way to design such a form for the self-appraisal process. Thinking of assessing your skills? 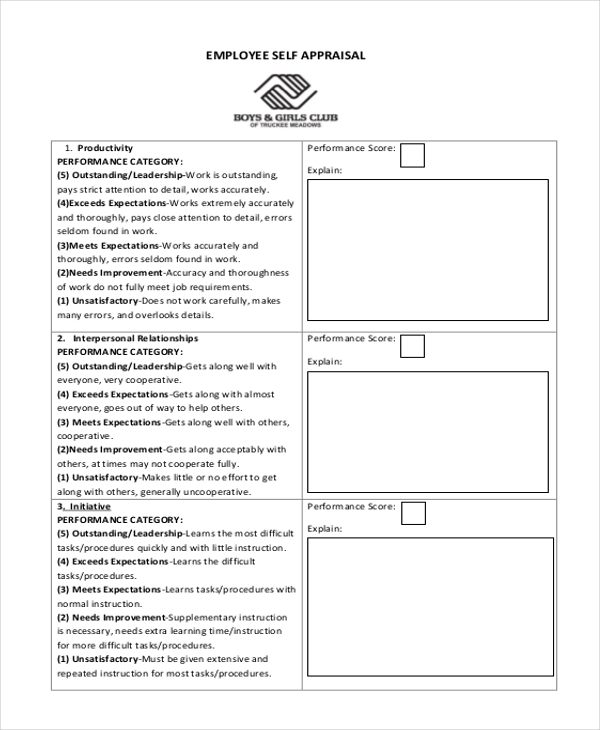 Why not get some help from this self-appraisal of skills example form. This comprises of the parameters that you should take into consideration while conducting a self-assessment. You may also see Performance Appraisal Forms. Organizations which work against stringent goals can ask their employees to assess themselves using this Employee Self Evaluation Forms. This helps them in analyzing their strengths and identifying their weaknesses. 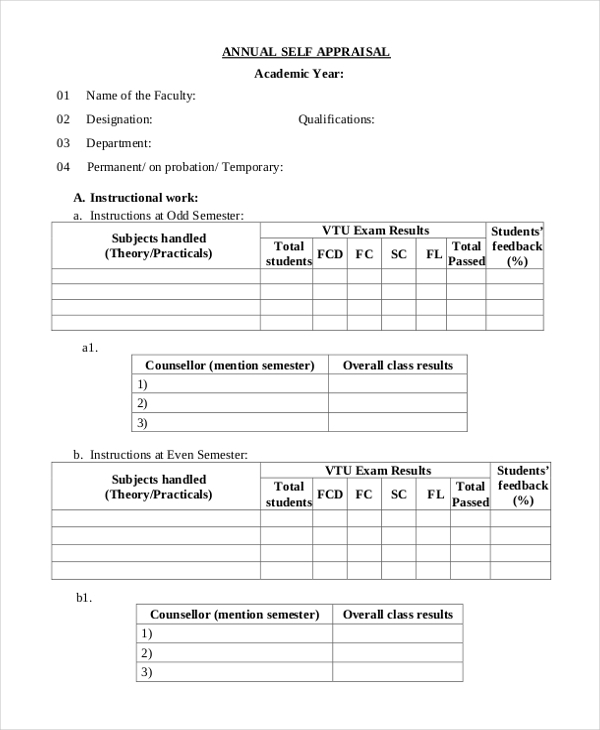 As the name indicates, this example form gives you an idea of the right way to conduct a self-appraisal and come up with a detailed report about your assessment. The report, in turn, helps you to identify your positive and negative traits. If you have volunteered your services with an organization, they may ask you to conduct a self-appraisal of yourself time and again to see if you are working to match up to their expectations. The aforesaid form can be used for the purpose. If you are working with a rehabilitation center or social service center, use this form to help your clients assess how your services have benefitted them. This form also helps them identify the benefits they have gained from your guidance and services. Educational institutions expect their faculty members to enhance their positive traits and work on their negative traits to be a model for their students. 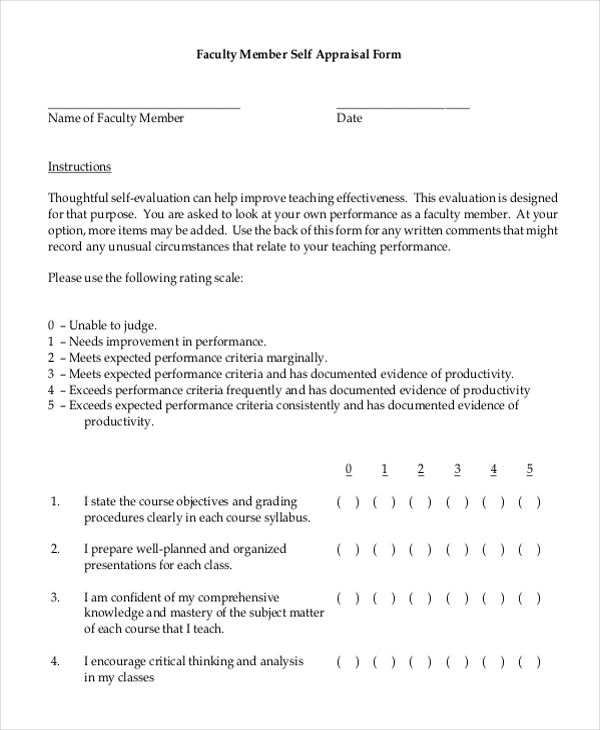 They make use of this Appraisal Review Forms to help the faculty members to get in touch with their inner selves every now and then. What are the Benefits of Using Self-Appraisal Example? 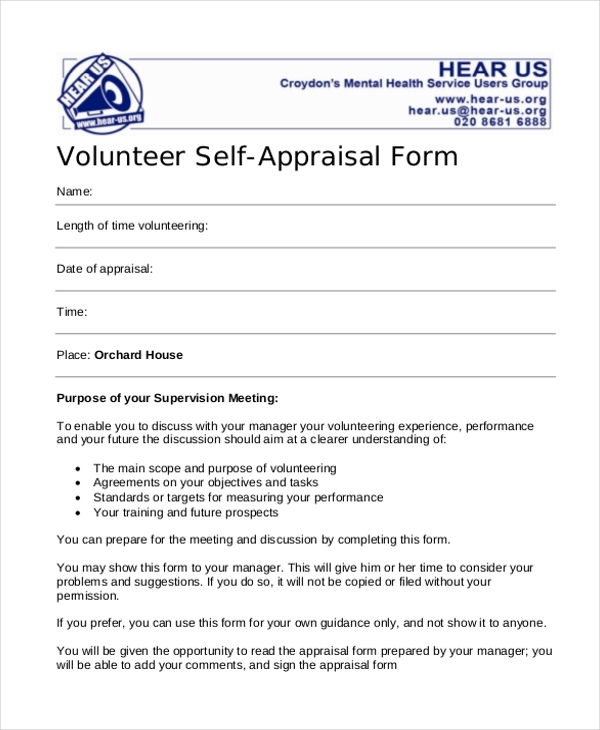 Need some help in designing a self-appraisal form? Take a look at our wide selection of self-appraisal examples and choose the one that is apt for your requirement. Customize this sample to come up with a unique appraisal form. 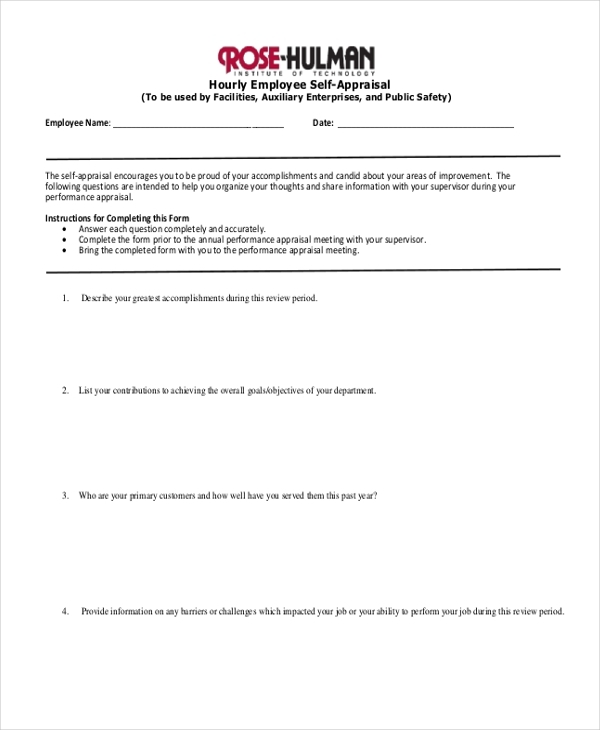 These example forms are easy to download and are print ready. You can also see Retail Appraisal Forms.